During tonight's Wrestle Kingdom 13 pre-event press conference, one half of the current IWGP Tag Team Champion and Bullet Club member, Tama Tonga, had a message for some of his specific fans, The Young Bucks, and WWE star Roman Reigns as well. Tama Tonga and Tanga Loa are currently in their fourth-reign as IWGP Tag Team Champions, having won the titles from The Young Bucks at Long Beach, California, as part of the first ever Fighting Spirit Unleashed event. Tama and Tanga have dominated the heavyweight tag division in New Japan Pro Wrestling for years, and have defeated almost every single team who stepped in their path, including the likes of The Bucks, Los Ingobernables de Japon, War Machine (now War Raiders in WWE), and Killer Elite Squad. Prior to The Guerillas of Destiny's IWGP Tag Team Championships defense against the team of Los Ingobernables de Japon (Sanada and Evil) and The Young Bucks in a Triple Threat Match tomorrow at Wrestle Kingdom 13, Tama Tonga had a lot to get off his chest at the pre-event press conference. Usually billed as 'The Bad Boy', it now looks like Tama is all up for a new change in the new year, as he has transformed his moniker to 'Good Guy' Tama Tonga instead, and during tonight's press conference, 'Good Guy' Tama apologised to a number of people, including all the fans whom he had roasted throughout 2018. In addition, Tama also apologised to The Young Bucks and the rest of The Elite for kicking them out of The Bullet Club, and further also wished them all the best for the inauguration of their All Elite Wrestling promotion. 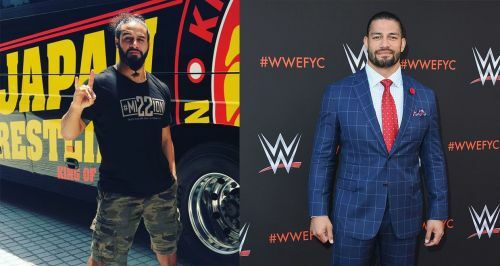 Lastly, the BC OG also apologised to former WWE Universal Champion, Roman Reigns, for the heated beef they had on social media, prior to Reigns' leukemia revelation. Tama then went on to wish Reigns a speedy recovery as well. Tama Tonga and Tanga Loa will be defending their IWGP Tag Team Championships tomorrow night, during Wrestle Kingdom 13 at the Tokyo Dome, in a three-way match against The Young Bucks and LIJ.